When I completed the design for the Pennsylvania Association for Sustainable Agriculture (PASA) silent donation piece, it looked too much like the piece I had donated to PASA last year! Those same earthy greens and browns may relate to the agricultural theme, but I decided I wanted something different; so I created a bold scarf with “dots” — a motif I call “Bliss,” because of how much I love fabricating the dots. The scarf has a mid-layer that’s half silk fiber, which gives the piece lots of loft, an almost weightless quality. I used dyed Wensleydale wool locks as asymmetrical fringe. The white silk of the mid-layer is visible here and there along the edges, adding contrast and sheen. 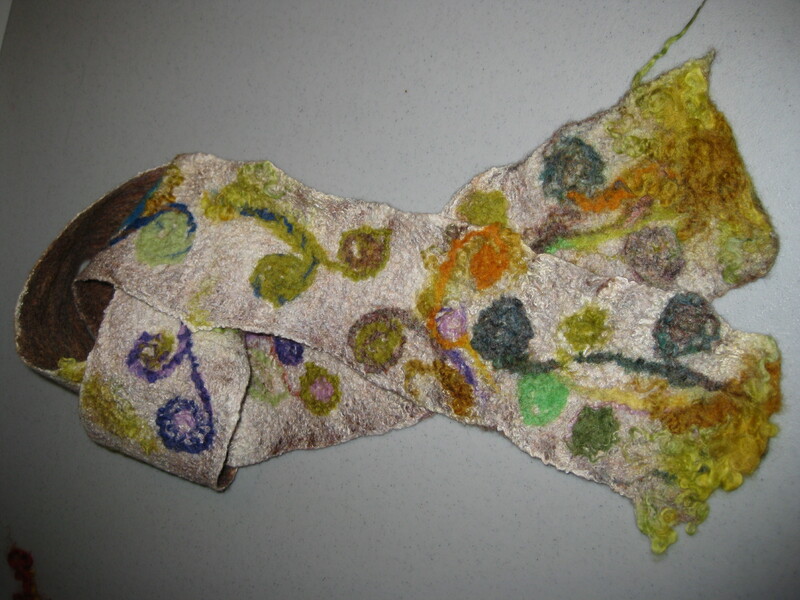 I created a second scarf using the “Fiddlehead” motif, using my handspun yarn to evoke the curled fronds. Abundant use of silk fiber gives the surface a lot of shimmer. The scarf is so lightweight and soft, subtle with lots of movement! At some of the edges, the fibers extend around the curves of the fronds; this random quality was unplanned, one of those wonderful feltmaking surprises. Working on designing an item to donate for the silent auction to benefit PASA (Pennsylvania Association for Sustainable Agriculture) Conference, in State College on February 4 – 6. 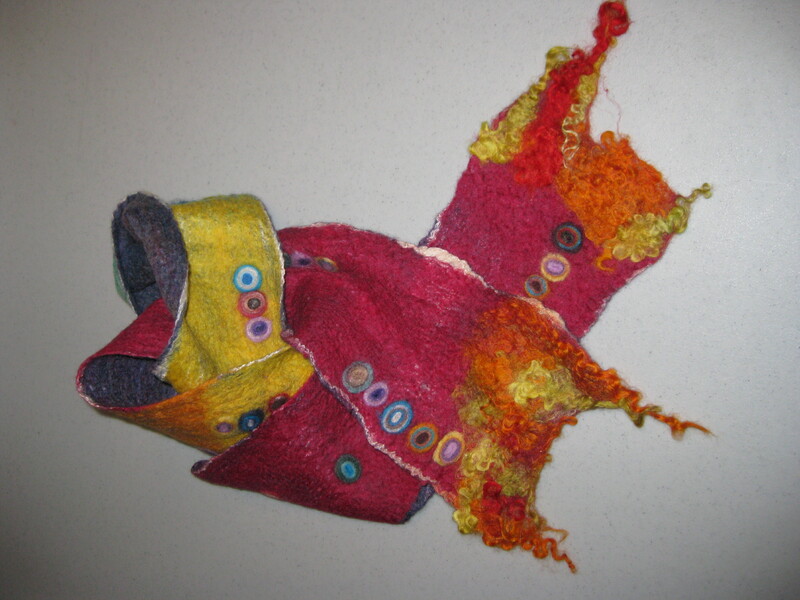 The theme for this year’s conference is “The Sustainable Challenge: Providing for a Livable Tomorrow.” The past year, as I’ve worked full-time in the studio, I’ve often thought about how “sustainable” my art practice is: how much feltmaking can one do, for how long, at what cost? Feltmaking is a physically-demanding art form. It’s hard on the hands, all that wet, soapy, hot fiber that gets worked and worked. Cost of materials continually rises, of course. Time in the studio means time not available for other things. To some extent, artmaking is an obsession: whatever work I’m doing always feels (when it’s done or sometimes, when it’s almost done) like “the piece I need to do to get to the other side.” Stepping back and reflecting on HOW one wishes to work, and WHY, as an artist, is a healthy habit. In the coming days I’ll be sketching designs, spinning some fibers and creating something — maybe a scarf or a tea cozy — reflecting the theme of “The Sustainable Challenge,” to support PASA. If the gods of technology smile on me, I’ll post photos here… This morning, I read the wonderful felting blog by Nicola Brown, “Clasheen.” She describes her current situation in a very cold Ireland: she has no water. One photo on her blog shows snow being melted in a pot to brew some tea. So Nicola set up her old loom and wove a scarf, since she didn’t have the water to do much feltmaking. Her optimism and creativity are inspiring! A new year; deep, icy winter in Central Pennsylvania; a studio brimming with fiber. I’ve been aiming to find more synthesis in my work: to more clearly express my thoughts and feelings through what I’m creating in the studio. 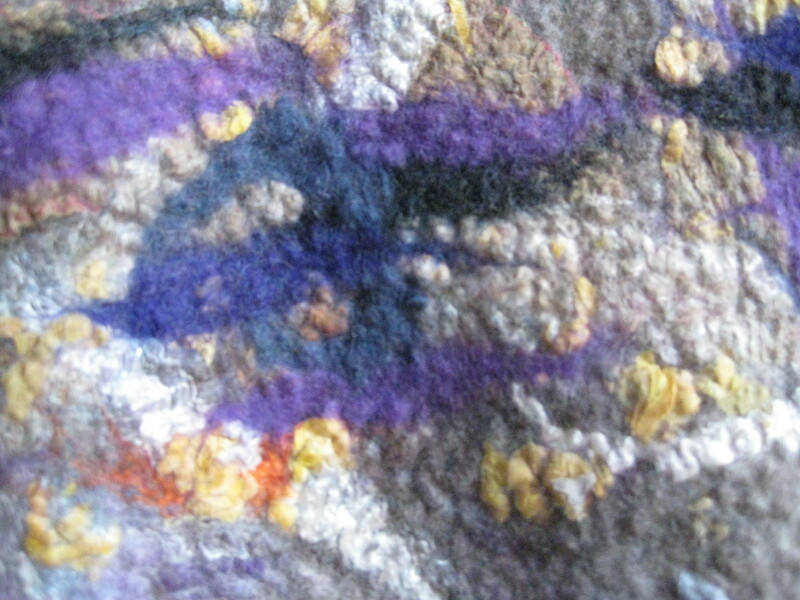 Feltmaking — and the rest of life!